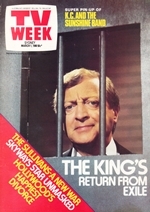 Graham Kennedy seems almost certain to be returning to TV sometime later this year. The former Blankety Blanks host has patched up his differences with the newly-reformed Ten Network and is full of admiration for Rupert Murdoch, who has bought the network's Sydney and Melbourne channels, sparking speculation that he may soon return to TV on the revamped network. "Rupert and I have had talks about a program which would probably do quite well on a Saturday night. It's based - but not tightly - on the show Chevy Chase does on NBC called Saturday Night Live. But I suppose it would inevitably resemble a 1980s In Melbourne Tonight if I was on it," he told TV Week from his waterfront home in Sydney's Hunter's Hill. But the 46-year-old has said that any return to TV won't be until late in the year as he has a number of film projects lined up for 1980 - The Club and Miracle At Mulga Springs - as well as his commitments in launching Sydney FM radio station 2DAY, of which he is a joint owner. 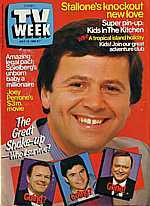 Five international stars are to be guests at the 1980 TV Week Logie Awards, to be held at Melbourne's Hilton Hotel on 14 March. Appearing at the awards this year will be: British performer Cilla Black, currently on tour in Australia; British actress Nicola Pagett of Upstairs Downstairs and also starring in the ABC series The Timeless Land; Barnaby Jones co-star Lee Meriwhether; American actor Greg Evigan, currently starring in the series BJ And The Bear and recently in the Broadway production of Grease; and the yellow-feathered Big Bird of Sesame Street. Actress Carol Burns, who played lesbian bikie Franky Doyle in the Ten Network series Prisoner, has been offered work in the US where she was holidaying recently. The 32-year-old had to decline the offer from Los Angeles TV station KTLA, due to existing commitments in Australia, but will be returning to the US later in the year. Burns has gained a following in the US, with strong ratings for Prisoner in the major markets of Los Angeles and New York, and has even had a fan set up a Carol Burns fan club - not a Franky Doyle one. A crippling illness has forced movie host Bill Collins to miss what was to be his first movie presentation for the Ten Network. The movie buff was struck down by spondylitis (inflammation of one of the vertebrae of the spinal cord) which left him almost unable to walk. He was in such pain that he was unable to travel to the TEN10 studios to present his first movie on the network, The Grass Is Greener. Following a lengthy course of acupuncture, Collins managed to get to the studios to appear on The John Singleton Show, but was forced to use a wheelchair because walking was almost impossible. Two days later he made his first movie presentation on Ten, and it was one of his favourite films, All About Eve. Stress and overwork are thought to be the cause of spondylitis, and Collins had been maintaining a hectic schedule in his transition from Sydney's ATN7 to the Ten Network, including several trips interstate for various appearances around the network. Saturday: ABN2 crosses live to Melbourne's Huntingdale Golf Course for the 1980 Australian Masters. Sunday: ABN2 presents its three-hour morning presentation of ethnic television programs, compiled by the Special Broadcasting Service. ATN7 presents the Rugby League pre-season competition, featuring Manly versus Parramatta, hosted by Rex Mossop. Monday: Celebrity guests on ATN7's Celebrity Tattletales include Johnny Lockwood, Doug Parkinson and Sean Kramer and their respective partners. Wednesday: In Kingswood Country (ATN7), Thel (Judi Farr) has saved enough money to buy herself a Datsun, but when Ted (Ross Higgins) finds out, he hits the roof and insists that they'd be better off investing the money. Thursday: In Skyways (ATN7), Louise (Tina Bursill), having discovered she was adopted at an early age, decides to try and track down her real parents. Friday: ABN2's rural affairs program Countrywide returns with a new series. Bill Collins' two movies on TEN10 are The Spiral Staircase followed by Splendor In The Grass. 19-year-old Kylie Minogue is the most popular actress in Australia, and has scored a chart-topper with a remake of the '60s hit Locomotion. But apart from all the fame, money and glamour, Kylie is battling to remain a normal teenager. "You can lose yourself in all that publicity hype." Ten months after a car accident almost claimed his life, actor Jon Blake is still in a semi-comatose state but his mother Mascot has taken care of the actor's every need since he came out of hospital. He has been able to sit up and open his eyes, but is unable to speak except to occasionally utter the word 'Mum'. Former Countdown host Molly Meldrum has scored the only interview with pop megastar Michael Jackson in the lead-up to his national tour. The interview, to appear on Sixty Minutes, will be held in Japan and is expected to go to air in a few months to coincide with the release of Jackson's new album Bad. A Country Practice is about to lose its vet Ben Green as the show's scriptwriters decide there is nothing more they can do with the character. Actor Nick Bufalo, who had originally been asked to stay on another six months but will now depart in two, is unimpressed at the producer's change of heart. Today weatherman Brian Bury says he hates the constant comparisons with his US Today rival Willard Scott. Bury says "I've been doing this for 28 years. I don't think he's been doing it that long." The former newsreader, talk-show host and race-caller is also preparing to tackle his latest venture - co-hosting the Home Shopping Show with Karen Pini. "It's going to be the most enjoyable way to shop in Australia," he says. Tommy Hanlon Jnr, host of GTV9's It Could Be You, is set to race in the upcoming 'Armstrong 500' at Phillip Island, despite concerns of station management. TCBY's producer Myke Dyer has been banned from accompanying Hanlon in the motor race scheduled for 19 November. For the first time in Australia, the Federal Government and the Opposition will campaign on national television in the lead up to the Federal Election, scheduled for 9 December. Sir Charles Moses, General Manager of ABC, has announced that both the Government and "official Opposition" will be allowed a total of two hours of airtime each on the national broadcaster. Geoff Hiscock of Melbourne's GTV9 has announced his engagement to Kathy Danaher, one of the members of the singing group The Four Debs. Despite claims by GTV9 that their children's session is the longest running, HSV7's Peter's Fun Fair with Zig and Zag (Doug McKenzie and Jack Perry) is about to celebrate its fifth anniversary on-air. The first edition of Peter's Fun Fair went to air on 10 November 1956, just days after HSV7 first officially launched, while GTV9's children's session with Happy Hammond did not begin until the following January. Whatever happened to old-fashioned romance? Being an actress since the age of nine, 16-year-old Rebekah Elmaloglou has not had the most normal of childhoods and often yearns to be 'just an average teenager'. However, her Home And Away character Sophie is about to embark on a simple 'old-fashioned' romance with Blake (Les Hill) and Rebekah hopes her character can be a good role model for teenage viewers. Number 96 set to re-open its doors! Network Ten executives have been viewing old episodes of the 1970s hit Number 96 with plans to revive the series in 1990 in an attempt to boost the network's flagging ratings. Network executives believe that there is room for a more adult-oriented drama as opposed to Ten's other soap offerings, Neighbours and E Street. Former Chantoozies band member and manager David Reyne has decided to move from the music business and concentrate on acting. The 31-year-old already has roles lined up in the upcoming Seven Network mini-series Flair, the telemovie Bony, and a new Nine Network mini-series Golden Fiddles. While viewers have given a lukewarm response to Seven's new cop drama Skirts, it seems that some of the shows cast members have caught the eyes of other producers. Ben Mitchell, who plays Constable Bevan Quinn, is believed to have been approached by the producers of Neighbours. Another Skirts regular Antionette Byron is also being pursued by the producers of E Street. The Seven Network is still to decide on whether to renew the weekly police drama for a second series. Former Neighbours star Rachel Friend is becoming one of TV's hottest properties. The 19-year-old has a lead role in Network Ten's comedy pilot Lipstick Dreams, and also in Nine's mini-series Golden Fiddles. Later in the year, Rachel will be off to the United Kingdom to star in the pantomime Aladdin's Lamp. The Nine Network has had to revoke plans to move Graham Kennedy's Australia's Funniest Home Video Show to the Wednesday 7.30pm timeslot following an ultimatum from the host. The new timeslot would have seen AFHVS up against Seven's comedy Hey Dad! which is produced by a close friend of Graham's, Gary Reilly, and the Nine Network host refused that both shows enter a ratings battle. The Great TV Shake-up - who'll survive? The Nine Network undergoes one of the biggest shake ups in its history with the sacking of Bert Newton after 26 years at the network, the axing of The Ernie Sigley Show in Victoria, and rumours of The Mike Walsh Show - which had only recently moved from midday to prime time - being next on the chopping block. Ray Martin, new host of The Midday Show after several years on 60 Minutes, is reportedly safe in his new role, as is Hey Hey It's Saturday host Daryl Somers. The cast of the new Seven Network soapie Neighbours celebrate the shows 100th episode, to air on 5 August 1985. Cast member Alan Dale, who had previously starred in The Young Doctors which ran for a record 1396 episodes, informed the cast "We've only got to do this 14 more times over to beat The Young Doctors' record". 20-year-old Ann Peacock, daughter of Andrew Peacock and Susan Sangster, is keen to pursue a career in showbusiness. Following recent stints at Melbourne radio stations 3XY and 3UZ, Ann has just co-hosted with Darryl Cotton a pilot for an entertainment program for Network Ten, similar to the US program Entertainment This Week. Angry Anderson, lead singer with rock group Rose Tattoo, is enthusiastic about his new role as a reporter for The Midday Show. Angry is hoping to use his new position to tackle serious social issues such as drug abuse as well as other issues affecting younger Australians. Following the departure of Paul MacFarlane (Tony Bonner) the position of airport manager at Pacific International is up for grabs. Contending for the position are Louise Carter (Tina Bursill) and Gary Doolin (Gerard Kennedy). Peter Mochrie from The Restless Years was recently voted one of Australia's 10 Best Dressed Men - but the 21 year old is more concerned about making a future 10 Best Actors list. The former model has just completed 12 months on the Ten Network series and has ambitions of following the footsteps of Hollywood actor and producer Clint Eastwood. ABC's popular motoring program Torque returns with a review of one of Australia's most popular cars, the Holden Commodore. Ian Fairweather, a pioneer of Australian children's TV and producer of the long running Here's Humphrey, is leaving Adelaide's NWS9 after fifteen years to move to Sydney to become head of the new Broadcasting Information Office. 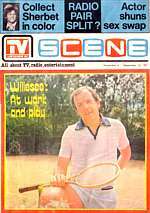 TV Times announces that this issue, 28 June 1980, is the last to be published as part of the joint venture between the Australian Broadcasting Commission (ABC) and Australian Consolidated Press (ACP). 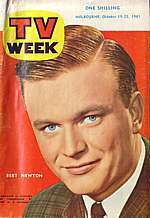 The magazine was launched by ABC as TV News in June 1958, and later evolved into TV News-Times and then TV Times. By 1960, ABC entered into partnership with ACP to publish the magazine. After 20 years, ACP has decided to end the partnership and bought out ABC's share of the title for an agreed sum - and would continue to publish the magazine with its own editorial staff. ABC has joined the fight to win exclusive television rights to the ABBA Australian tour coming up in 1977. Countdown's Ian 'Molly' Meldrum is confident that ABBA's management will select ABC's offer despite more generous offers being made by the Seven and Nine networks. GTV9's new late night movie host Issi Dye is incorporating more segments and studio guests into his hosting of Nine's overnight movies. The late night movie host is in competition with ATV0's Hal Todd who pioneered the late night movie presentations on local television. Joining Johnny Farnham and Maurie Fields on the set of the new Seven comedy Bobby Dazzler is Lucky Grills, comedian and star of police series Bluey. Lucky guest stars as himself in an episode where he meets Bobby on a telethon. The character of Bobby Dazzler is Farnham's first acting role. Despite the series coming close to cancellation during the year, ATV0 has announced that it will continue with The Box through 1977. The series will be reduced to either one hour or two half-hours a week, with the station believing that it can pick up more viewers by screening less often. On the popular Nine Network series The Sullivans, World War II is over and cast and crew gathered at Hawthorn Town Hall in Melbourne for celebrations coinciding with VP Day in the series. The Grundy Organisation has entered into partnership with a European company, the Paris-based Telecip, to produce two children's dramas costing $A2 million. The two new series are Secret Valley and Runaway Island. Secret Valley, an adventure about a group of children who turn a ghost town into a holiday camp, is about to begin filming north of Sydney. TV cop John Orcsik is not giving too much away about a movie project he is working on with colleague and close friend Paula Duncan. Meanwhile, Paula has recently recorded a single which she hopes to release soon. Actor Tom Burlinson, formerly from The Sullivans and The Restless Years, is about to embark on his most challenging performance playing the title role in the upcoming $A3 million film The Man From Snowy River based on the famous bush ballad by 'Banjo' Patterson. "A lot is expected of me, I'm working hard, harder than I have ever before, to make it right" the 25 year old actor told TV Week. Former Number 96 favourite Ron Shand has just finished a guest appearance in an episode of ABC's variety series The Saturday Show. Ron, celebrating 50 years in showbusiness, has barely been out of work since his role as the hen-pecked Herb Evans in Number 96 wound up in 1977. His appearance on The Saturday Show follows a recent eight-week stint in the long running soapie The Young Doctors. Two Melbourne millionaires are part of a consortium bidding to set up Australia's first cable TV system on the Gold Coast. Sir Roderick Carnegie and former Lord Mayor of Melbourne Ron Walker have entered a joint venture with Hoyts Theatres and Gold Coast radio station 4GG to bid for a licence to operate a cable TV service. Other potential bidders for licences include Queensland Newspapers and owners of the Townsville newspaper The Daily Bulletin.